Those seeking to find a leader in cardiac rehabilitation must look no further than Trumbull Regional Medical Center. The hospital’s Cardiac Rehabilitation Program is the only nationally certified program in the Mahoning Valley. The Cardiac Rehabilitation Program achieved re-certification in 2018 by the American Association of Cardiovascular and Pulmonary Rehabilitation. It’s also the only program in the area to have all certified clinical Exercise Physiologists and the only certified Cardiac Rehab Professional in the county. 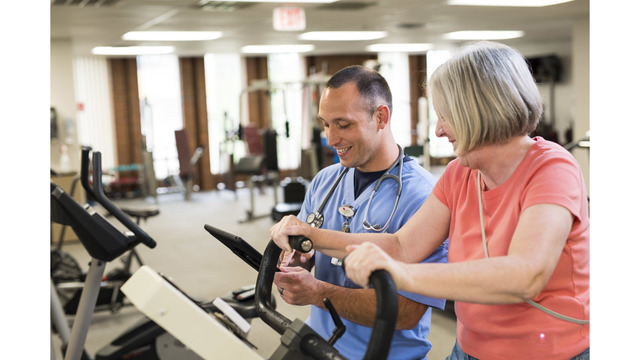 Recognized as leaders in the field in cardiovascular and pulmonary rehabilitation, the Cardiac Rehabilitation Program at Trumbull Regional offers the most advanced practices available, using a comprehensive risk factor modification program. Exercise is the cornerstone, coupled with education on nutrition, counseling, and support for patients and their families. Phase I begins at hospitalization and continues through discharge. This inpatient program combines progressive, monitored activity and education to prepare patients for discharge and help them begin healthy lifestyle changes. Phase II, a physician prescribed and supervised outpatient program at Trumbull Regional, begins after hospital discharge. Patients work to improve physical work capacity through an individualized exercise program, as well as receive valuable education to control risk factors. Patients meet three times a week for a total of 6-12 weeks, or 18-36 sessions. Sessions last approximately one hour in duration. Once Phase II is completed, patients are encouraged to continue with their new lifestyle habits and exercise. Cardiac Wellness is a medically supervised exercise program that focuses on promoting individuality and patient independence, so that you are educated and confident to exercise on your own. The Cardiac Rehabilitation staff supervises these sessions, which are held 2-3 times per week. Statistics show that patients that complete 36 sessions of cardiac rehab reduce the risk of cardiac mortality by 47 percent and heart attack by 31 percent. Trumbull Regional is the only program in Trumbull County to offer all three phases of cardiac rehabilitation. To learn more about cardiac care at Trumbull Regional Medical Center, visit trumbullregional.org/heart.